The canvases come in several sizes, and I went with the larger because the wooden frame obstructs much of the surface on the back. I also grabbed a skein of perle cotton in a light, light blue from the DMC Color Variations line. By the way, if you look at the back of the canvas, you'll see that it has a coating on it. 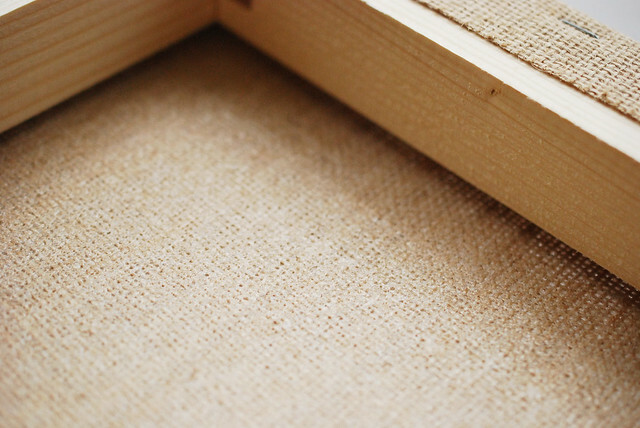 This makes the burlap not quite as open a weave as what you see. 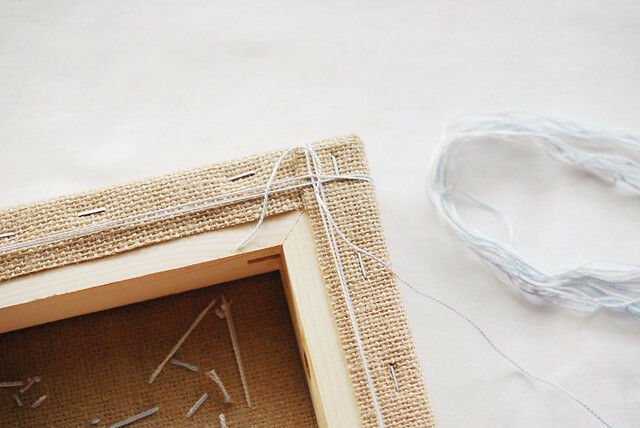 You will need a sharp needle to get through it, but the upside is that it helps hold the stitches in place a lot better than working with plain burlap. To make big stitches, cut a piece of perle cotton to about 36 inches. 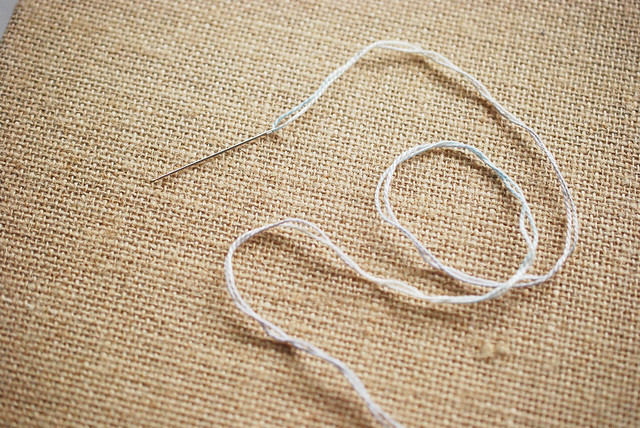 Thread the needle and double the thread, tying a knot at the end. 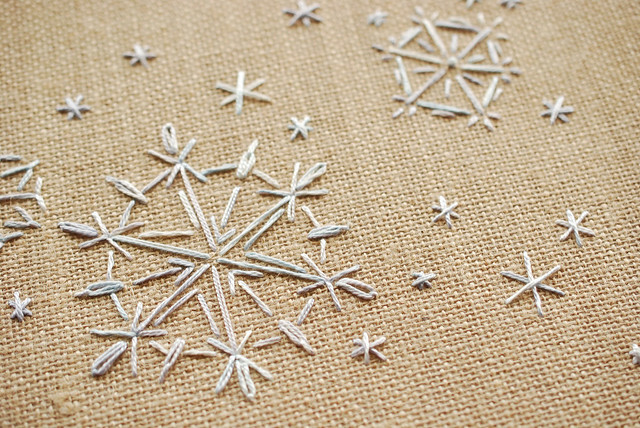 Figure out approximately how you want the snowflakes placed, then start stitching. 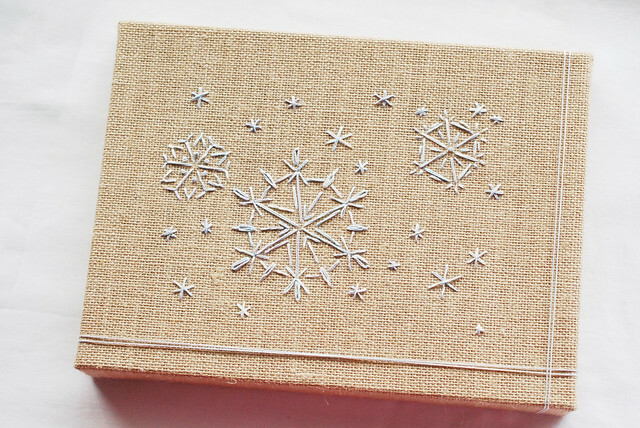 Snowflakes are really fun and easy to improvise! I started out each of mine with six "spokes" that I guessed at for their length and placement. With those as a framework, you can start adding in the rest of the details. I did three main snowflakes, each in a different size. 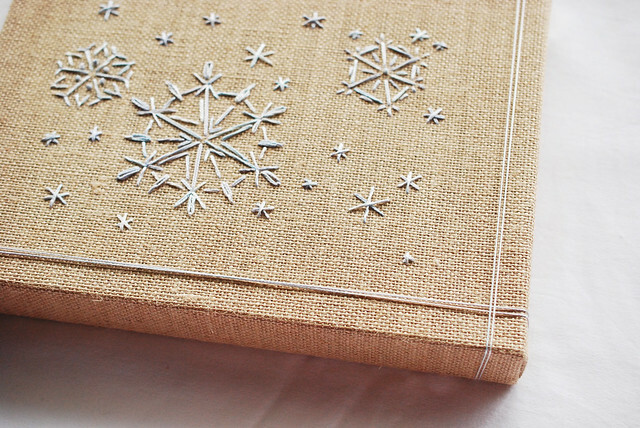 To fill in the empty areas, you can add little twinkle stitch snowflakes! You now get to see my scary back! 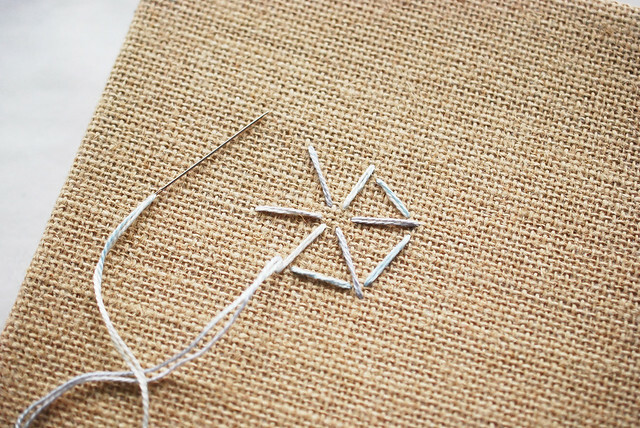 For those extra little snowflakes I just jumped around instead of tying off the thread. The real point here is to show you the area you can stitch in. I got as close to the frame as possible, but that still leaves a lot of empty space on the front borders. 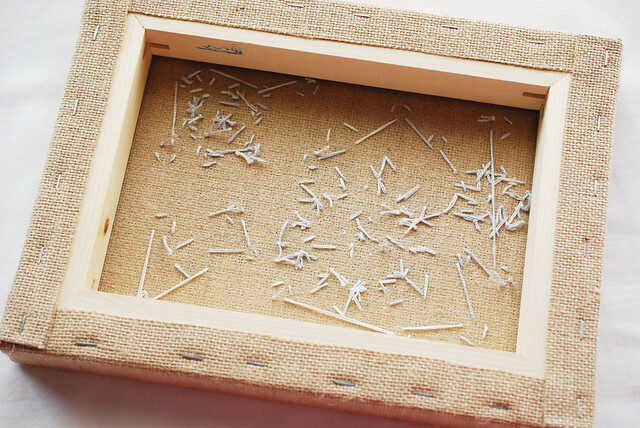 To frame up the design, you can use ribbon, ric-rac, fabric, or floss. 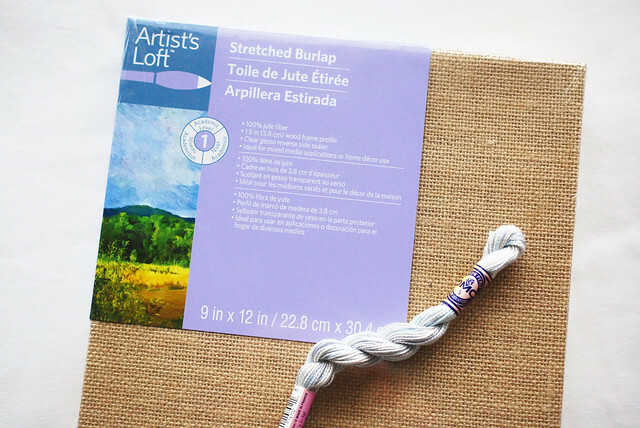 I used my same perle cotton and wrapped it twice around the canvas, tying it off at the corners. Actually, I only did this to two sides, because I liked the balance of it. Add what you like best to yours! And with that, you've got embroidered artwork that is suitable for hanging...just like that! This is genius!!! Do they carry the canvasses all the time? It was a new item for them back when I got it, and I'm pretty sure that it was going to be something they carry on a regular basis. This turned out so lovely! I love the addition of the two lines on the sides, the balance is perfect. I also always love seeing the back of pieces, it makes me glad I'm not the only one who jumps around like that! ooh! 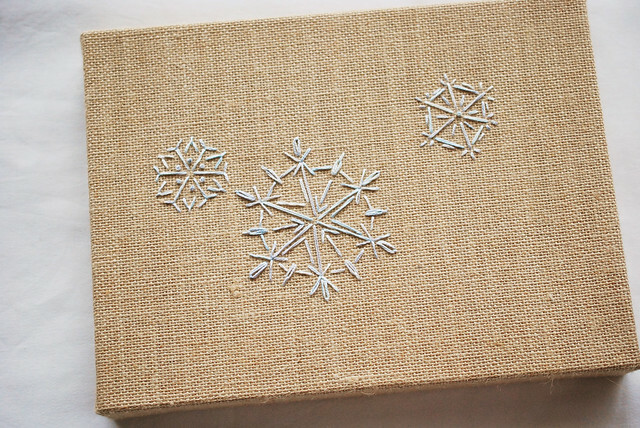 the snowflakes look so cool against the burlap background, great idea! gorgeous! i love its natural, organic look. So creative! Thanks for sharing....happy new year!! Looking forward to your inspiration this year. Thanks! Oh, wow! I love this! I haven't seen these canvasses yet. The added thread lines really set it off. I noticed an entire endcap of them in our craft section at Walmart. I did something like this for my mom for Christmas, but instead of burlap I found some really great sparkly gray fabric and left them in hoops. They turned out so pretty! WAH! I love this! Now to head to Michaels and spend that gift card from my MIL this past Christmas. Can you estimate what count fabric this would be roughly equivalent too? Do you think this would work for cross stitch? Because I don't work with cross-stitch fabrics on a regular basis, I'm not confident that I could give an accurate estimate of what size this would be similar to. Probably a little larger than most aida cloth? But I'm sure it would work for cross-stitch.